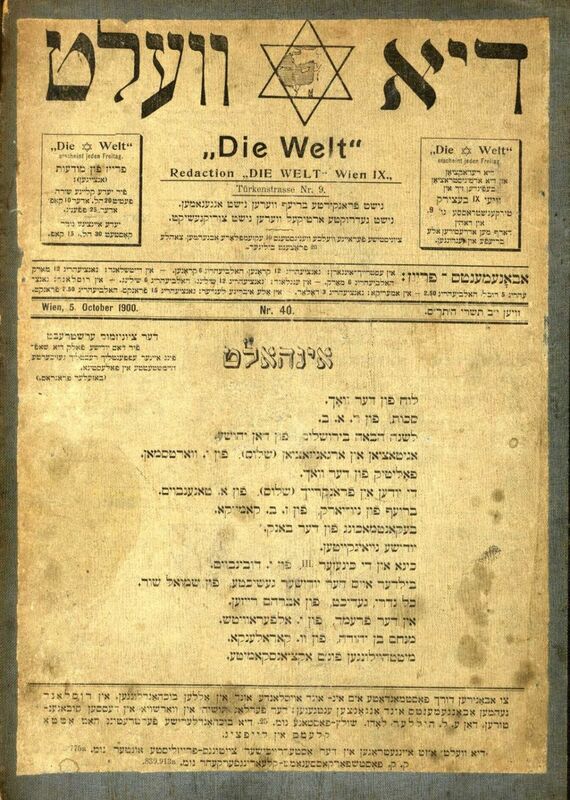 Two bound volumes of 27 issues of the weekly Die Welt, rare publication of the Yiddish weekly. The weekly Die Welt was founded by Herzl in Vienna in 1897, as a medium for the dissemination of his Zionist doctrine, Herzl actually wrote the newspaper himself, from beginning to end. It was quite successful - at its peak, it sold tens of thousands of copies. Feivel Berthold (1875-1937) replaced Herzl as editor in 1900. The newspaper closed in 1914 due to the world war. Two volumes, 27 issues. 30 cm. Moderate-fine condition, slightly disintegrating binding. The leaves themselves are complete, with some aging stains.